A slyly funny coming-of-age novel about a young woman fumbling her way into the mysteries of loss and the travails of adulthood as she tries to make sense of a vanished mother's legacy. When 22-year-old Olivia learned that her mother had only months to live, she pulled up roots, leaving Vassar and her career plans far behind to be with her mother for her last days. And yet, just four months after her mother's death, everyone in Olivia's family already seems ready to move on. Her brothers are settled comfortably in careers and families of their own; her father has already started to date again, inviting a woman named June on a family trip. Still reeling from the loss, Olivia looks for a new start of her own, throwing herself headlong into Manhattan's fast-moving media world, where she is alternately demeaned by bosses and pursued by men. But as Olivia tries to piece together an adulthood without her mother to guide her, she makes a shocking discovery: a secret romantic correspondence her mother had with a man who only signed each letter “F.” As she tries to untangle the mystery of F, Olivia will journey halfway across the world, to an ashram in rural India, on a quest that will reconfigure everything Olivia thought she knew about her family and her own place in an increasingly complex world. 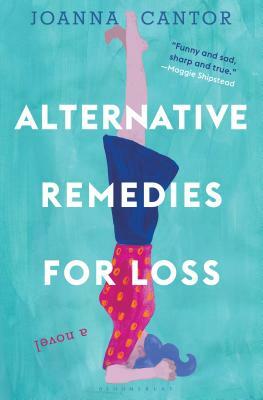 A profoundly moving and keenly observed contemplation of the debts we owe to the past and the ways we discover our futures, Alternative Remedies for Loss is the rare sort of book that can break and mend your heart in a single and unforgettable read. Joanna Cantor holds an MFA from Brooklyn College. She was awarded a Vermont Studio Center Fellowship. She lives in Brooklyn with her husband and dog. "Joanna Cantor’s debut novel is sure to become the Eat, Pray, Love for the millennial generation." - Real Simple, "Best Books of 2018 (So Far)"